We’re in the midst of a generational shift, with Millennials expected to surpass Baby Boomers in 2015 as the largest living generation. Each generation has unique backgrounds, lifestyles, values, and expectations that influence how they browse the Web. Successful strategists recognize these differences and offer their audience compelling content tailored to these singularities, but what if your target audience spans several generations? Is it possible to make content that is well-received and shared by multiple age groups? To better understand the habits of each generation and any overlaps,BuzzStream and Fractl surveyed over 1,200 individuals and segmented their responses into three groups: Millennials (born between 1977 and 1995), Generation Xers (born between 1965 and 1976), and Baby Boomers (born between 1946 and 1964). We compared their responses to uncover similarities in digital consumption preferences along with any unique trends among all three generations. Here, we’ll break down three key takeaways you can use to elevate your future campaigns. 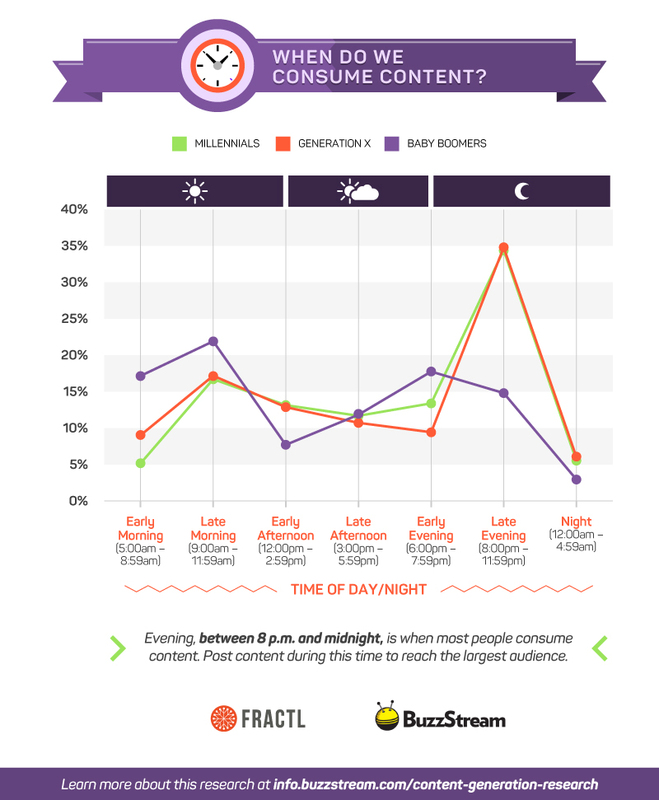 Baby Boomers consume most of their content between early morning and noon, whereas Millennials and Gen Xers consume the most during the late evening. Baby Boomers peak between 9 a.m. and noon with more than 20 percent of respondents online at this time – nearly 30 percent more than Gen Xers and Millennials. The least popular time for most respondents to engage online is late at night – between midnight and 5 a.m.; this period earned fewer than 10 percent from each generation. During Millennials’ and Gen Xers’ peak hours – between 8 p.m. and midnight – 80 percent more of these generations are online compared to Baby Boomers. 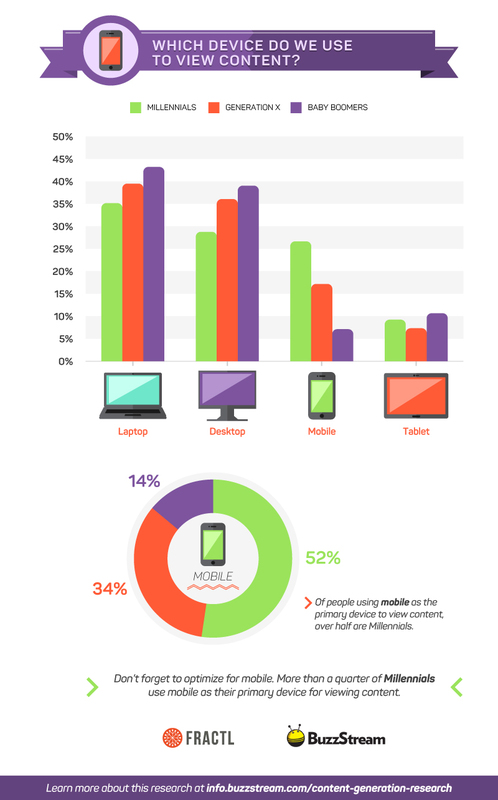 More than 50 percent of respondents who primarily use mobile devices for content are Millennials. Baby Boomers use laptops the most – 43 percent – 20 percent more than Millennials. More than 115 percent more Millennials are using their mobile devices compared to Baby Boomers. Preferred content types span across all three generations, but specific genres differ significantly. The least preferred content types – flip books, SlideShares, webinars, and white papers – were the same across generations too although not in that exact order. Reviews closed out the top five for Baby Boomers, whereas this content type didn’t even make the top 10 for Millennials. 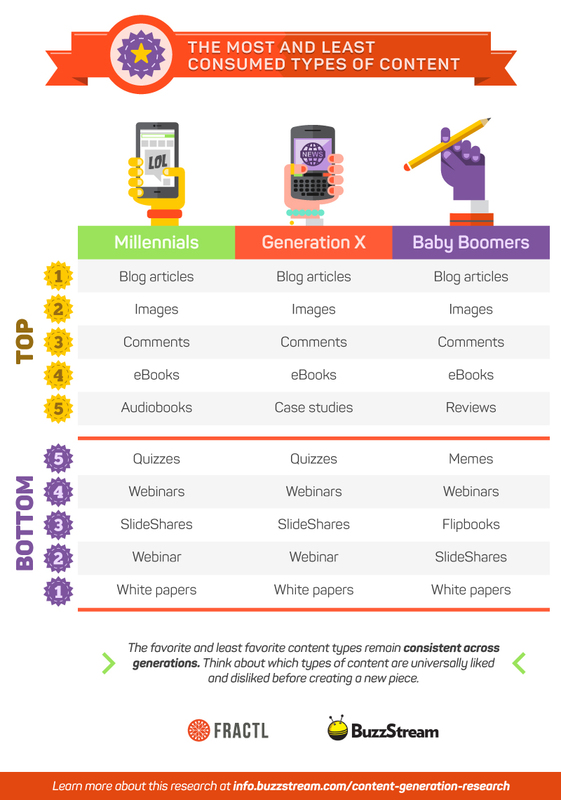 Lists, infographics, podcasts, and guides all landed somewhere in the middle for each generation in terms of preference. Although sites such as BuzzFeed and PlayBuzz seem to be popular with younger generations, Gen Xers and Millennials listed quizzes as one of their five least favorite content types. Millennials held a strong lead in technology at 19 percent – 71 percent more than Baby Boomers. Baby Boomers lead in world news and politics at 18 and 12 percent respectively – its biggest win coming from the politics vertical, with 120 percent more Baby Boomers reading about politics than Millennials. Gen Xers held its strongest lead in healthy living at 13 percent while also nabbing the top spot in the personal finance and parents verticals. The least popular vertical for Millennials was style, whereas Gen Xers and Baby Boomers equally engaged the least in both the environment and style verticals. It’s essential for digital strategists to understand what different audiences connect with and align their content accordingly. Multi-generational marketing is more than just appealing to the unique needs of individuals within one specific generation; it’s about appreciating the similarities and differences among each group and improving your content accordingly. Review this deck for additional insights, including the preferred video length and weekend consuming habits of each generation. Although there is no one-size-fits-all campaign, successful marketers can create content that multiple generations will want to share. With managers and leaders typically talked about in the same framework, they are both typically – and somewhat incorrectly – seen to be very similar, or even as pretty much the same thing. Whilst there’s definitely a few extremely apparent resemblances between them, a leader and a manager should be viewed as separate beings, with each one contending differing mind-sets and usually establishing differing methods via their allocated purposes as part of a company. Leaders are original, in the sense that they’re often the people responsible for establishing the main corporate plan of action that then sifts throughout a business. As it filters throughout, it gets to the managers, who then hand it over and replicate it to their team members and staff; in other words, they are imitating the leadership’s original plans and actualising it into practical use. In getting the work completed, the manager’s involvement in human resources will primarily and mainly be on their skill level and capabilities. In the end, their main concern is that the task gets finished and is finished accurately. Simultaneously, so that the company runs as swimmingly as possible, a leader’s attention will be leaning towards people more specifically, especially those making up the management team directly below them in the chain of command. The manager must be in control – it’s fundamental to be in control of workloads and staff and can therefore sadly depict them in a bad way, in other words it might not make them very popular. The role for leaders is to inspire trust and inspire workers to have faith in their work and the business. Be warned however: an untrustworthy manager can assist in making a leader appear untrustworthy, whilst an untrustworthy leader can help to make a business or organisation look untrustworthy as well. The manager’s responsibility is to ensure that the business continues to perform as an well-oiled, efficient machine. It’s the leader’s concern to grow and develop the business on a regular basis and for a manager to then maintain and take care of that growth and development via their management abilities. Leadership without management can result in fantastic ideas and theory, but could potentially ignore right and effective implementation. Management without leadership on the other hand might result in well-managed staff and tasks, but may lack direction and might miss possible opportunities. Therefore it is hugely important that not only both management and leadership are practiced, but that they are both practiced hand in hand, together, efficiently and effectively. If this is true then a business has the best possible chance at success, present and future. Le cap de la trentaine est un tournant important. Voici quelques astuces pour l’aborder dans les meilleures conditions. Le cap de la trentaine constitue le moment idéal pour adopter des habitudes qui vous aideront à vous épanouir dans votre travail et dans votre vie personnelle pour le reste de votre vie. Pour vous donner un point de départ, nous avons parcouru les fils de discussion Quora les plus récents concernant cette étape cruciale de votre vie. Nous en avons tiré les éléments les plus intéressants. Pavez la route de votre épanouissement. Voici 10 changements à intégrer à votre mode de vie à l’âge de trente ans. Si jamais vous avez commencé, arrêtez tout de suite suggère Cyndi Perlman Fink. Vous ne pourrez pas réparer les dégâts déjà causés mais, selon une étude, le risque de mortalité est moins élevé de 90% chez les personnes qui abandonnent la cigarette avant 40 ans. Profiter du week-end pour rattraper son manque de sommeil peut être tentant. Cependant, Nan Waldman recommande d’aller se coucher et de se lever à la même heure tous les jours. Selon les experts, si vous dormez différamment ne serait-ce que quelques jours, vous risquez de dérégler votre horloge interne et vous vous sentirez fatigué plus tard le soir. Evitez-vous une vie de troubles du sommeil en vous forçant à respecter un rituel de coucher et de lever chaque fois que c’est possible. « Essayez de bouger le plus possible », conseille Alistair Longman. « Peu importe si vous marchez, si vous faites du vélo, si vous courez, si vous faites du fitness, de l’escalade ou de la natation, tant que cela implique de vous dépenser ». Passé 35 ans, vous commencerez à perdre de la masse musculaire. Faire du sport devient donc particulièrement important. Mais choisissez toujours une activité qui vous plait . Si vous optez pour quelque chose qui ne vous convient pas, il est peu probable que vous vous y teniez. « Ecrivez votre vie ! Relire une trace écrite de vos journées plus tard vous amusera », écrit Mark Crawley. Même si vous préférez garder vos pensées pour vous, coucher vos idées et sentiments sur le papier peut vous aider à surmonter les événements stressants. « Plus vous prendrez tôt l’habitude de mettre de l’argent de côté, plus vous continuerez sur le long terme », affirme Cliff Gilley. Vous pouvez avoir l’impression que vos années d’or (celles de la retraite) sont très éloignées. Mais plus vous commencez à économiser tôt, plus votre argent fera des petits grâce aux intérêts. Selon Robert Walker, « Si vous êtes satisfait de ce que vous avez, vous vous sentirez plus heureux ». C’est une question de reconnaissance : une recherche laisse à penser que si vous appréciez ce que vous avez, vous augmentez votre bonheur et vous diminuez les sentiments négatifs. C’est peut-être pour cette raison qu’Oprah Winfrey tient un journal quotidien de gratitude depuis des années. « Quand j’ai eu 30 ans, j’ai arrêté de ressentir le besoin de plaire à tout le monde. La question est de choisir ses amis et ses contacts avec plus de soin », déclare Kevin Teo. Ce contributeur s’est rendu compte qu’il n’était pas obligé d’être agréable avec les personnes qui ne l’étaient pas avec lui. Que vous choisissiez de réduire votre liste de contacts Facebook à 500 amis, ou simplement de sortir davantage avec les personnes qui vous rendent heureux, investir votre temps et votre énergie avec sagesse est un point important. « Si vos frères et sœurs ou vos amis réussissent des choses que vous n’êtes pas capable de faire, acceptez-le », conseille Mahesh Kay. « Ne soyez pas trop dur avec vous-même ». Comme l’écrit un psychothérapeute, regarder en permanence par-dessus l’épaule de votre voisin pour voir ce qu’il fait ne vous aidera pas à atteindre vous épanouir. Vous feriez mieux de passer plus de temps à penser à vos objectifs et à évaluer vos progrès à ce niveau. « Nous faisons tous un grand nombre d’erreurs. Ne revenez pas sans cesse sur vos fautes passées. Tirez-en des enseignements puis mettez-les derrière vous et allez de l’avant », conseille Liz Palmer. Un psychologue affirme que l’auto-compassion, c’est-à-dire la capacité à vous pardonner et à apprendre de vos erreurs, est la clef du succès. Les personnes qui pratiquent l’auto-compassion ne considèrent pas leurs faiblesses comme une fatalité et évitent de refaire la même erreur plusieurs fois. L’économie globale manque de perspectives de croissance à moyen terme (voir ici). Si l’on veut comprendre la dynamique récente des marchés financiers et des matières premières c’est par ce prisme qu’il faut commencer. Cette perception s’est accentuée récemment avec l’évolution de la situation en Chine. Jusqu’à présent, les autorités chinoises avaient géré le ralentissement de leur croissance avec des mesures internes. Cela s’était traduit notamment par des évolutions rapides de l’endettement des entreprises publiques. Cela n’a fonctionné qu’un temps (voir ici). Le soutien via le marché des actions n’a pas bien fonctionné non plus. Les questions sur la dette publique sont un peu dans les discussions économiques comme un marronnier: la dette publique focalise l’ensemble des inquiétudes et des incertitudes sur l’évolution d’un pays. Une augmentation trop rapide est perçue comme un signal de dégradation irrémédiable du futur. Ce n’est pas aussi simple, heureusement. Change is pretty much a constant state of affairs in the 21st century, and in no area is this truer than that of technological development. Technology has swept aside vast, powerful established industries, transforming them fundamentally in just a few years. Take, for example, the way that music has changed, moving from LPs to CDs to music available in online files. This occurred in a very short time frame. Other organisations have found their industries transformed to a similar scale. All of this means that understanding upcoming disruptive technologies can help organisations to create new business models and adapt in good time. PreScouter developed a reportwhich showed that there are nine disruptive technologies that promise to revolutionize the world as we know it. The nine are big data, automation/AI, Internet of Things, MEMs, nanomaterials, biotechnology, terahertz, advanced energy and 3D printing. Each of these is now described. 1. Big Data – PreScouter predicts that “Big Data will be a $50 billion industry by 2017”. This is no big news, as many have predicted how big data will shape the world and will impact industries and organizations.The volume of data that people are producing is increasing at a tremendous rate, and this is only likely to further grow as a result of technology like wearable devices. At the same time costs of storage of this data have declined and this will enable predictive relationships to be produced according to PreScouter. 2. Automation and Artificial Intelligence – PreScouter believes that artificial intelligence is starting to get introduced into consumer goods and this is already a $20.5 billion industry. Pre-runners like Siri are thought to be outdated and too “gimmicky” to be useful. AI that is placed in the backend however provides websites the ability to present different information to consumers based on their own preferences. This clearly has considerable marketing implications. Another important issue is the impact of automation and robots on economy and labor. What some call the “robots economy” is revolutionizing what we know as work, and the trend promises to continue to develop. 3. 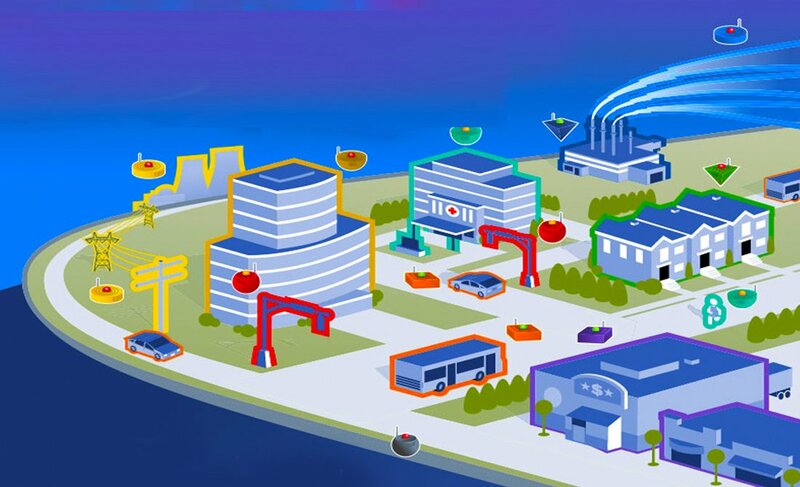 The Internet of Things – while so many devices are not yet connected to the Internet, by 2022 PreScouter believes that there will be a network of 50 billion connected objects. 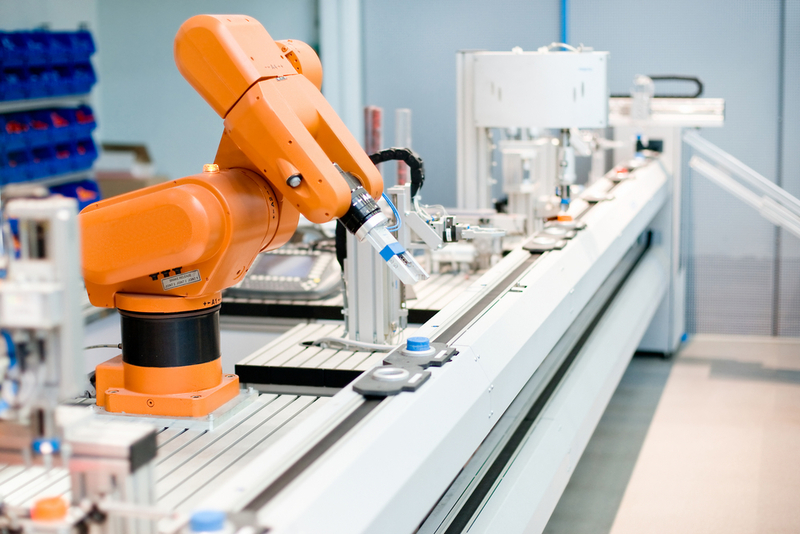 When this is paired with the technology for artificial intelligence it is believed that factories will be able to become smart, and that this could contribute a whopping $2 trillion to the global economy. 4. 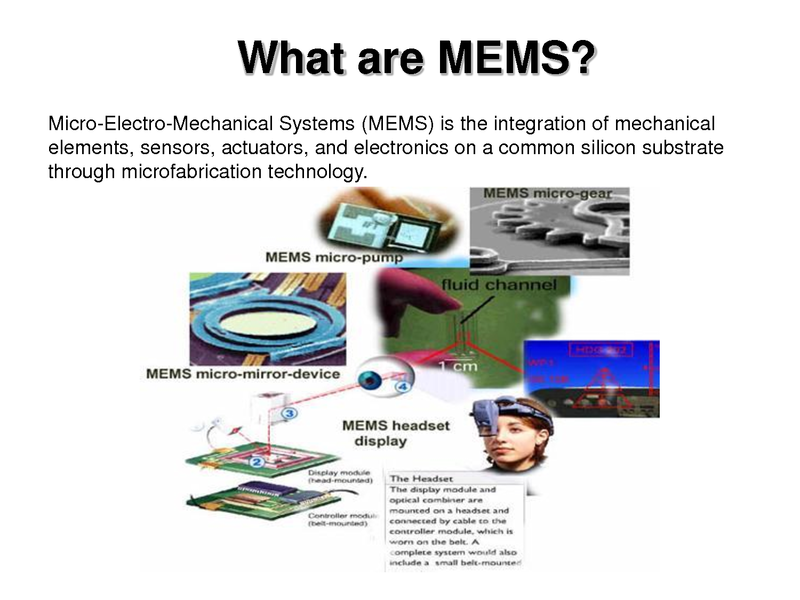 Microelectromechanical Systems (MEMs) – MEMs are reported by PreScouter to be sensors that transfer information between the worlds of the physical and the digital. It is argued by PreScouter that advances to make these devices more miniature have transformed the medical world as well as industrial diagnostics. An health revolution has been promised by many. An interesting report published by MIT´s technological review reports on the latest advancements on this important area that combine Big Data with MEMs. 5. Nanomaterials – related to the MEMs detailed above, nanomaterials are explained by PreScouter to have driven miniaturisation. They are also able to be used to create new classes of materials, such as changing the colour, strengths, conductivities and other properties of traditional materials. The market is already thought to be worth more than $25 billion in this area. 6. 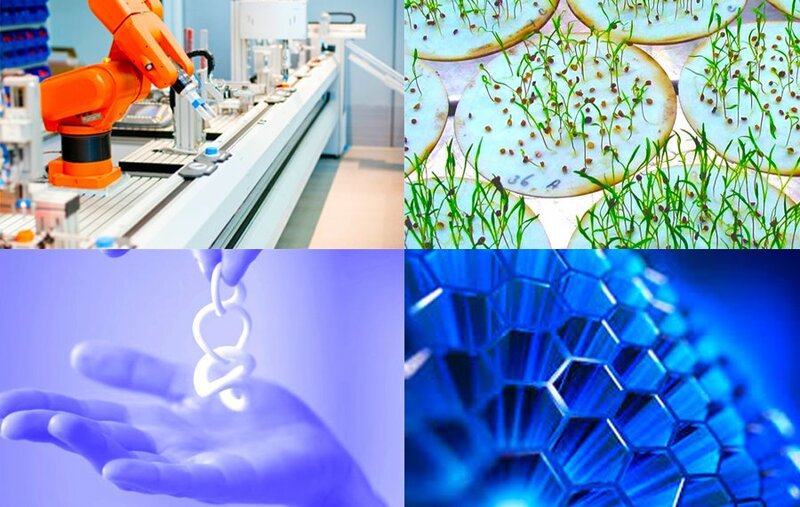 Biotechnology – agricultural science is believed to be advancing to new boundaries beyond that of breeding and crossbreeding, according to PreScouter. Indeed, it is explained that biotechnology has advanced to such a point that crops are able to be developed that are drought-resistant and have better vitamin content and salinity tolerance. 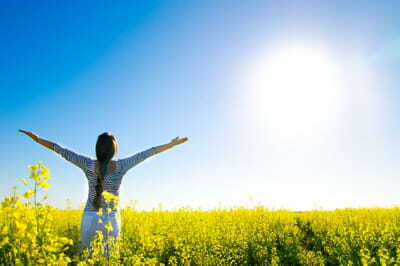 All of this has tremendous potential to get rid of the problem of hunger in the world. The market already exceeds $80 billion a year, argues PreScouter, and it is growing rapidly. 7. Terahertz Imaging – PreScouter reports that the market for Terahertz devices is predicted to grow by 35% per year annually and to reach more than $500 million by 2021. But what is it? Terahertz Imaging “extends sensory capabilities by moving beyond the realm of the human body”. This helps to create imaging devices that can penetrate structures, for example. They are being used to detect explosives that were previously considered to be invisible, as well as in path planning for self-driving cars (PreScouter). 8. Advanced Energy Storage and Generation – the ever expanding population of the world has an equally ever expanding need for energy, and this is being made more challenging by legislation to deal with the challenges of climate change. There have been significant advances to battery technology according to PreScouter, and this alone is estimated to have an economic impact of $415 billion. Greener products are also much more incentivised and it is thought likely that cold fusion power could become viable, argues PreScouter. Solar Power has also developed considerably and is an area that promises to grow considerably and become a viable energetic alternative, as its becoming increasingly cheaper. 9. 3D Printing – last but not least, 3D printers are making tremendous strides, and PreScouter points out that this is already a $3.1 billion industry that is growing by 35% each year. This will continue to transform industries as the prices of printers drops and more people can gain access to them. On the other hand the Maker´s mouvement is gaining momentum, which is producing a new generation of people interested and with the skills to do things. As we emerge from what has been a very fragile economic climate, many organisations are now embarking on business improvement initiatives in a bid to greatly enhance customer service and sustain growth and profitability. In many cases, companies concentrate on only one element of change and disregard other factors when making improvements. This often leads to change being unsustained or results not being delivered at all. 1- Customer journey: Many organisations fail to grasp the importance of the customer journey and experience. By taking the time to understand customers’ current and future needs, companies are better placed to answer these. Equally, business practices can be developed that enhance the customer experience and lead to increased growth and loyalty. The customer is the life blood of the company, without the customer we don’t have a business, yet all too often they are overlooked. 2- Operating Framework: Many businesses assume that the development and implementation of new technology is the answer to all operational and reporting problems. The reality is, this will only support existing behaviours, rather than changing them. A system is not a substitute for management action. If the system is not updated and used properly by the people within your business, it will not be effective. In order to drive and support the right kinds of behaviours, an effective operating framework is required. This is the glue that holds any business together. It comprises the forecasting, planning, controlling and reporting of work. It enables key questions to be answered like what needs to be delivered and when? What and how many resources are needed? How are you performing against plan? What has been achieved? How can you improve? 3- Processes: Companies tend to stick to what they know. They believe that operational processes that have always worked will continue to be effective and deliver profit. Changing a process will cost time and money and is often something that teams would rather avoid. 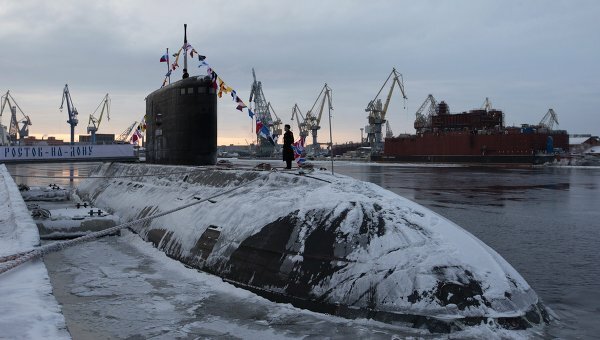 However, operational processes inevitably become out of date. Steps are introduced without careful consideration of the wider impacts, and slowly materials and time are introduced to make life “easier”, or to meet “customer” demand. This can cause your once efficient process to become inefficient. It will cost your business more if you don’t change your inefficient processes. Teams are not always compliant and become complacent, if the process is not easily executed and intuitive. Often teams find short cuts, even if those short cuts cost you money. In addition, when processes are re-engineered, it is normally through some kind of technology implementation or a Lean/Six Sigma type initiative. Typically, once re-engineered, they are well laid out and logical. However, the control of the processes is often what’s missing, allowing things to go low visibility, creating chases and causing frustration for both staff and customers alike. Processes can be controlled through active management and an effective operating framework. 4- Policies: The common understanding is that policies are put in place to satisfy a regulatory body or meet the needs of an accrediting body, that will award some sort of recognised badge, ITIL, ISO, H&S, IIP etc. Businesses believe that this will enable the organisation to gain status and recognition within their field. Some policies are enforced and are a legal requirement. In order to adopt policies successfully, the necessary systems and processes need to be embedded first and most importantly, employees need to be fully trained in their execution. 5- People / Staff Engagement: It is assumed that people within the business should be committed and loyal because they are being paid. Firms also believe that if they give their employees a new system to use, or train them in a new process that it will be followed without question and supported. The people within your business are the most influencing factor in determining whether your improvement initiative succeeds or fails. If the teams within your business do not use the system, follow the process or comply with the policy, your initiative will fail. Staff will only do this if they are fully engaged. Managers have a responsibility to ensure their teams’ values and beliefs align to the goals and objectives of the business. Furthermore, it is imperative to ensure the attitudes and behaviours of staff within your business are engaged and positive, and the communication within your company is concise, open and honest. The people within your business hold the key to its success. For your business to realise and fulfil its potential, these five factors must be considered. Whether your company is looking to cut costs, maintain strong growth, greatly enhance the customer experience or gain a competitive edge, Balcroft can help you implement sustained change to ultimately achieve your long term business aims and goals.